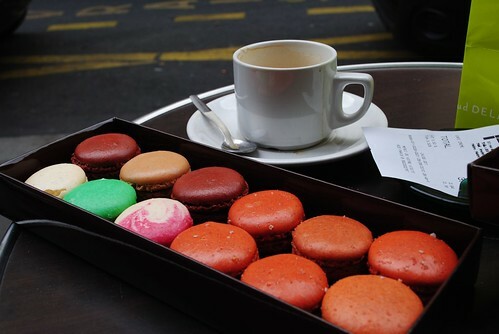 Before going to Paris, I had never tried a macaron. For some reason, I always wrote them off as a pretty little novelty dessert that probably tasted like a dry crumbly cookie. That is, until I tried one. I was wandering solo down Rue des Martyrs in Montmarte and spotted a beautiful unique-looking patisserie. 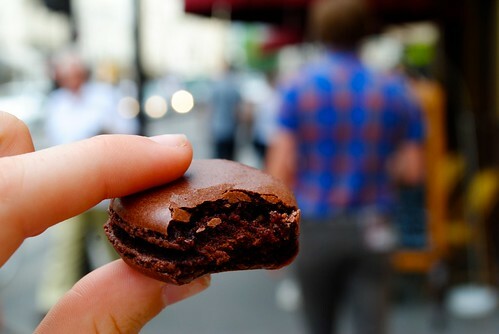 I never pass a patisserie without going inside. The line was long and I was a little intimidated by all the elegant French woman (just comes with being language-inhibited) so I made a snap decision and pointed to the Caramel Fleur de Sel macarons. I bought three, to share of course, and didn't plan on touching them until I rejoined Tyler and Mike. Needless to say I got a little curious, all three macarons were gone in five minutes, and I went straight back to order a dozen. Never judge a dessert.